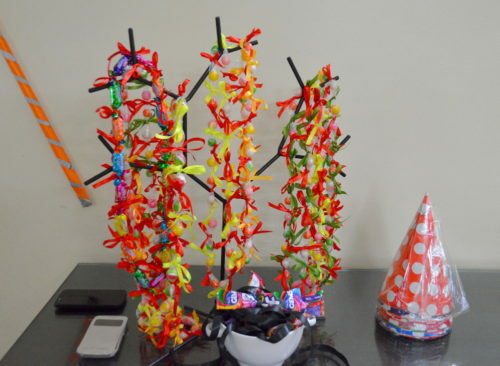 The ideas were split into decorative items, menu items (that which can be consumed), return gifts and wearables. We made candy necklaces. This was made using a satin ribbon and tying up candies on them to resemble a necklace. I wasn’t sure whether the boys would fancy wearing a necklace, so i made a bow-tie for them. Gems has a 10 rupee long packet. A black satin ribbon was used to tie by pinching it at the center to resemble a bow-tie. 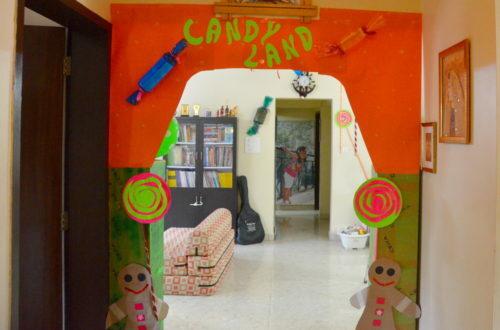 We created an arch with couple of cardboard boxes and some chart paper. 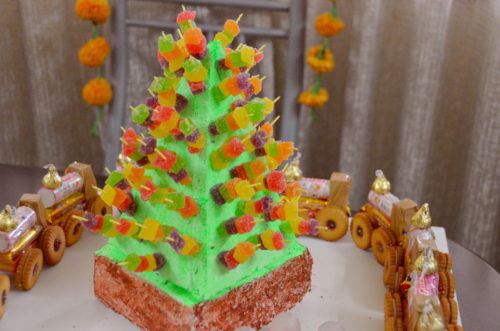 The candies were made by rolling coloured cellophane paper on thin bottles. 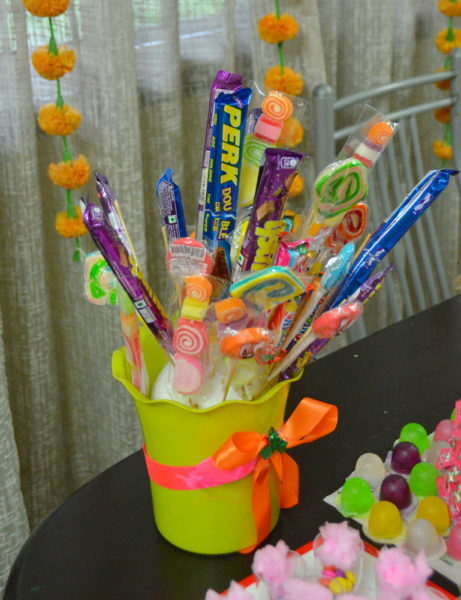 The lollipops were made by sticking coloured paper strips on circular pieces of cardboard and rolling up newspapers to make the stick. I made a simple chocolate bouquet by sticking various long chocolates onto a circular thermocol piece placed in a vase. 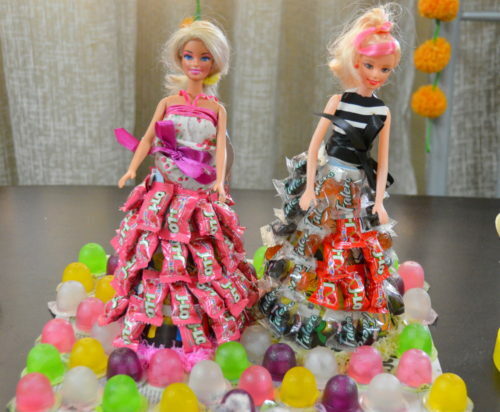 We also made candy skirts for barbie dolls. The candies were chosen based on the colour of the dress. 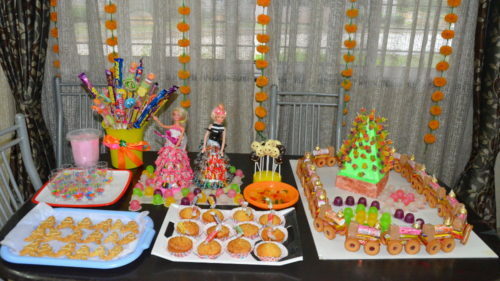 I wanted to make many things for the kids to munch on. 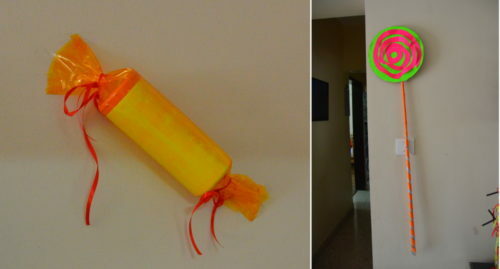 We stuck coloured jujubes on a stick and then put them up on a thermocol decoration to resemble jujube kebabs. 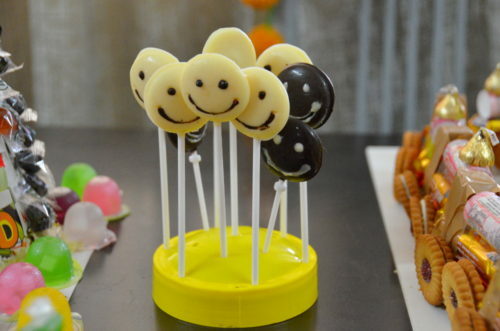 I had also bought cooking chocolate bars and then using a smiley mould, made smiley chocolate lollypops. 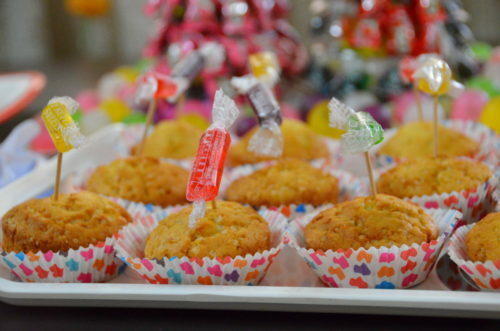 We made vanilla muffins and put a candy on top of each of them. 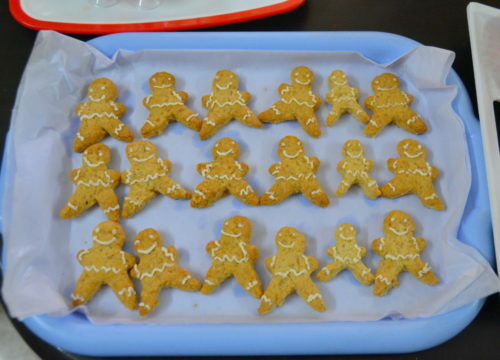 Using gingerbread man cutters, i made cookies. 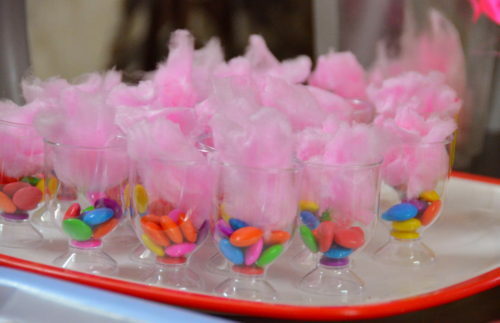 Going with the colourful theme, we put a small amount of assorted gems in a small cup and topped it off with strawberry cotton candy. 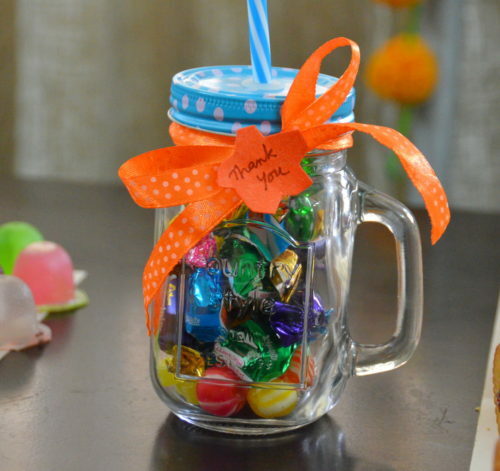 For the return gifts, we included a small glass jar filled with various types of candies and a satin ribbon for a bow. The first idea i got when planning for this party was to make a train. We made one by stacking a kit-kat and a five star for the body, hershey’s kisses for the steam spout, glucovita bolts to make the circular section of the engine, coffee bite for the back and stuck together with a cellotape to bring in the brown colour. For the wheels, we originally had thought gold coin chocolates, but we couldn’t get enough of them. 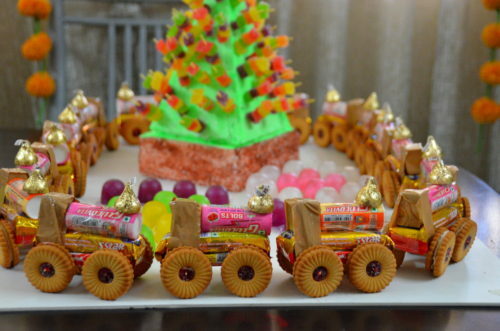 Then, jim jam biscuits were used for the wheels. What’s a birthday party without games? 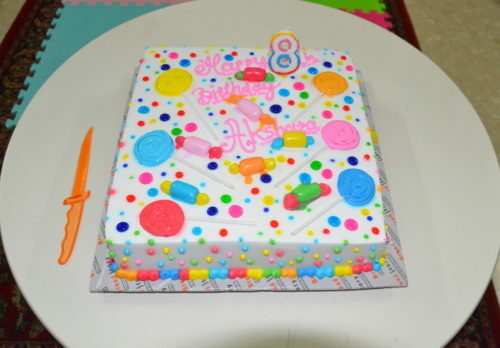 We had many small games, the prizes for which were, of course, chocolates and candies. Next story Lippan work (mud and mirror) from Kutch !